November is undoubtedly my favourite month on the calendar. It’s basically a month of celebration, ranging from the end of the academic year to birthdays (mine included!). Over the last few years, I’ve had an extra reason to get into the spirit of November with World Diabetes Day on the 14th of November. There are so many extra projects and campaigns happening to promote the event as well as opportunities to raise awareness about diabetes. In America, November also happens to be Diabetes Awareness Month for them. Being the international diabetes online community we are, everyone is jumping in on the action around the world. Some of you may have come across a few of the campaigns that are running at the moment such as Diabetes Month Photo-a-day and the Big Blue Test. 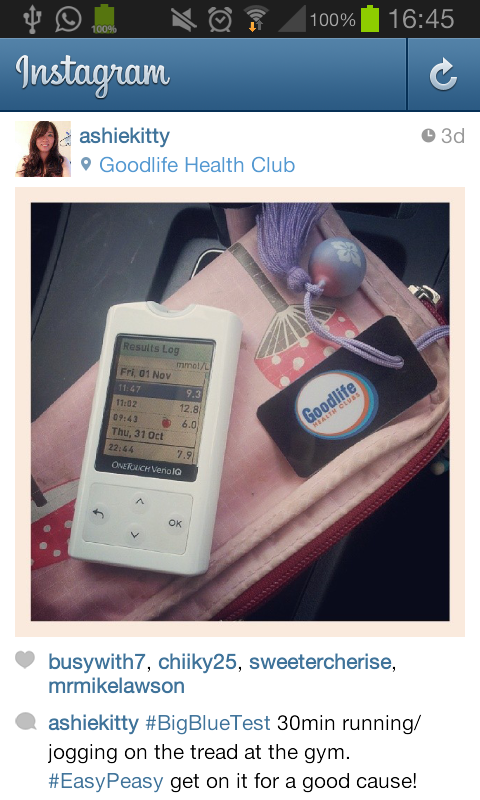 Instagram lovers will appreciate Diabetes Month Photo-a-day. Take a photo everyday following the daily prompts to help raise awareness of life with type 1 diabetes. Read more about it here and follow/ participate with the hashtag #dmpad on Instagram, Twitter and Facebook. I have to admit that the Big Blue Test by the Diabetes Hands Foundation is my favourite fundraiser/ awareness raiser to date. (I’m pretty boring on Instagram) The Big Blue Test movement sees to make a donation with every Big Blue Test done to provide people living with diabetes around the world with life-saving medical supplies. All you have to do is test, do 15 min or more of physical activity/ exercise, retest, log and submit! It’s pretty simple. My favourite part of this fundraiser is the research that accompanies it (inner research nerd in me approves). Last month, the Diabetes Hands Foundation presented a poster using data collected from the 2012 Big Blue Test campaign. In short, from over 7000 entries, an average BGL drop by 16.8% was seen after completion of the physical activity! It’s not surprising but the numbers are pretty mind blowing. Read more on that and see the poster here. This year, the Diabetes Hands Foundation are aiming towards achieving 20,000 submissions by WDD (14th November). Please help make this goal achievable! You don’t even need to have diabetes to participate. Read more on the Diabetes Hand Foundation here, log your Big Blue Test here and follow with the hashtag #BigBlueTest on Instagram, Twitter and Facebook. Hi Ashley! I’ve been doing a lot of work for diabetes awareness in November and would love to chat if you have a moment. Email me when you’re free- thanks!